It was our little brother's 17th birthday last weekend, so naturally, I wanted to bake! Knowing his love of chocolate, I knew exactly which book to find a recipe in... One Kirsty had bought me for my Birthday/Christmas (sorry! I can't remember!). The Hummingbird Bakery's Home Sweet Home. A perfect collection of amazing sweets and savouries and of course a selection of incredible chocolate cakes fill this beautifully bound pink baking bible. After finding the perfect recipe; Chocolate Cake with Vanilla Meringue Frosting, I went out to buy the ingredients and to collect my brother to help me bake! 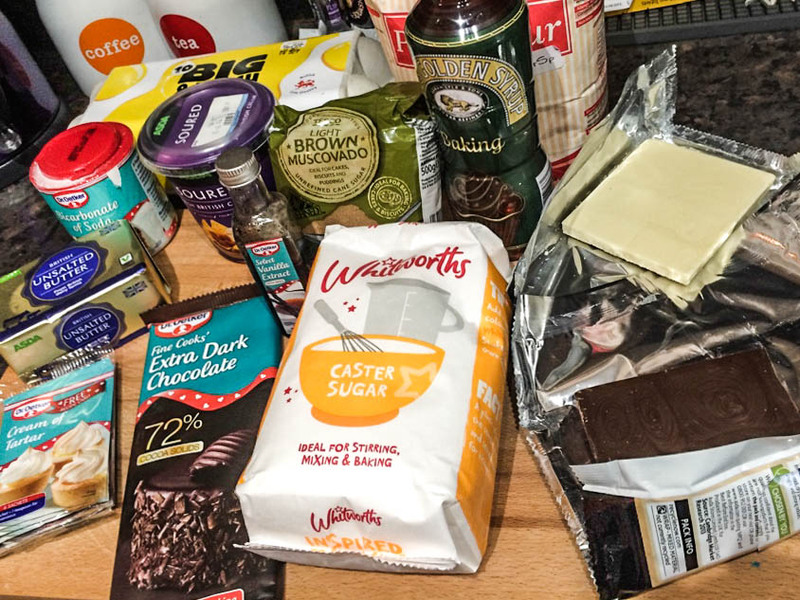 Method: To make the chocolate decoration, melt the milk chocolate and white chocolate separately in two small bowls, either in microwave-safe dishes in the microwave or set over small pans of simmering water. Turn one of the cake tins upside down and place a thin piece of plastic or clingfilm over the top of the tin. Place a blob of the melted milk chocolate in the centre and a blob of the white chocolate next to the milk chocolate. Using the back of a spoon, gently spread the chocolate around, marbling the two colours in a round disc that is the same size as the base of the cake tin. (Go crazy with this, we tried a swirly pattern and used a toothpick to create our design). 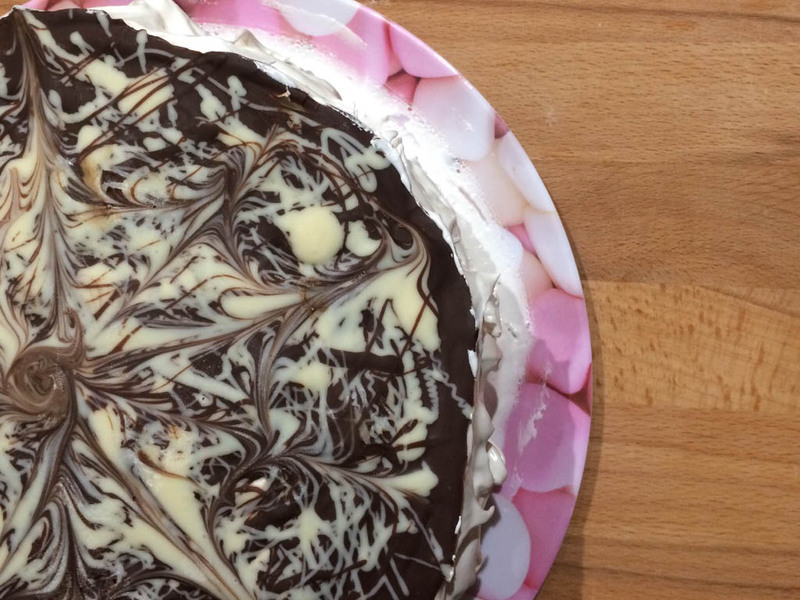 Once done, carefully lift the plastic sheet and set aside on a flat surface for the chocolate to set completely. Preheat the oven to 170C and line the cake tins with baking parchment. In a freestanding electric mixer with the paddle attachment or using a hand-held electric whisk, cream the butter and the sugar together until light and fluffy. And the eggs one at a time, scraping down the sides of the bowl and mixing well after each addition. Melt the dark chocolate in a microwave-safe bowl in the microwave or in a glass bowl set over a small pan of simmering water. With the mixer or whisk on a slow speed, pour the melted chocolate into the creamed butter and sugar mixture. In a medium bowl, sift together the flour, bicarbonate of soda and salt. In a jug, mix together the soured cream, vanilla extract and coffee. With the mixer or whisk on a slow speed, add the dry ingredients to the creamed butter and sugar in alternating additions with the coffee mixture. Once everything has been added, scrape down the sides of the bowl and mix well to form a smooth, even batter. Divide the batter evenly amongst the three prepared tins. Bake for approximately 20-25 minutes or until the sponge bounces back when lightly touched. Remove from the tins and allow to cool completely before frosting. Next, make the meringue frosting. In a medium saucepan, dissolve the sugar and golden syrup in the water. Bring this to the boil. This much boil, without stirring, until the sugar reaches the soft ball stage (a little bit of the syrup dropped into cold water will form a soft ball). If you have one, use a sugar thermometer to check when it is ready - it needs to reach 115C. Meanwhile, whisk up the egg whites with the cream of tartar and vanilla extract. This should be whipped up only until it is just beginning to become white and frothy. When the syrup is ready, carefully pour it onto the egg whites while the mixer is on medium speed, gradually increasing the speed whilst pouring. Once all the syrup has been added, turn the mixer speed to high and let the meringue whip up. It will become very white and glossy and the bowl will be warm to the touch. Let it continue to mix until the base of the bowl has cooled to lukewarm. Once the sponge layers feel cool to the touch, you can assemble and frost the cake. 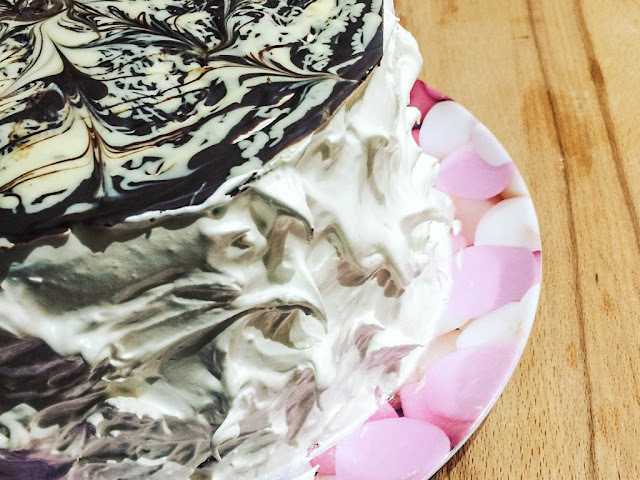 Place the first layer on a plate or cake stand and top with 3-4 tablespoons of meringue frosting. Smooth the frosting out using a palette knife, adding a little more if needed. Sandwich the second layer on top, then add more frosting, followed by the third layer of cake. Next frost the sides and top of the cake, covering it completely so that no sponge is showing. Carefully peel the plastic off the chocolate disc and place the disc on the top of the cake to finish. If the chocolate disc breaks, break it up further into more pieces and decorate the top of the cake with these. NB. This recipe was taken out of The Hummingbird Bakery's Home Sweet Home recipe book. Some wording may have been changed to simplify.